It is said that an Apache war party once entered Rocky Mountain National Park and a battle between Apaches and Arapaho's took place on the west end of Upper Beaver Meadows. The Apaches made a final stand before retreating from the area on a rocky outcropping on the west end of Beaver Meadows. Near that location rests this deceased pine. 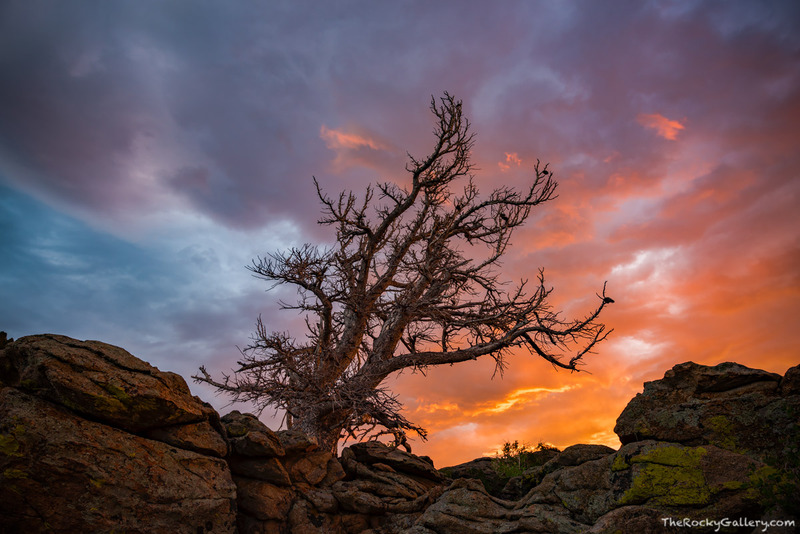 On a July morning, I sat on this rocky outcropping at sunrise and contemplated the storied history of this location as a beautiful sunrise unfolded above the twisting remnants of this strong pine. Photo © copyright by Thomas Mangan.